Bumblebees are often confused with honeybees. However, they are rounder, larger and furrier and come with a variety of coloured stripes across the end of their tails. Bumblebees live in small colonies of about 50-400 bees and don’t swarm. With the exception of the queen, they will all die in the autumn. Leave them alone if possible. Bumblebees are an important pollinator and rarely sting. 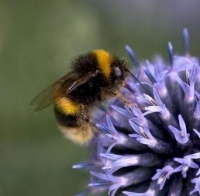 There are 24 species of Bumblebees in the UK, but only 8 are common and are under threat of extinction. For more information about bumblebees go to the Bumblebee Conservation Trust Website. 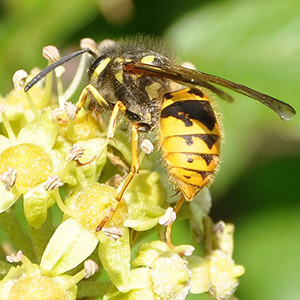 There are seven species of social wasps found in the British Isles. They are all superficially alike in appearance, being different only in size and minor details of colour patterning. All common wasps have sharp, tapered abdomens, striped in black and yellow. Their heads and thoraxes are mostly black. The exception to this is the hornet, the largest of our wasps, with a reddish-brown and black patterned thorax. Mated queen wasps hibernate during the winter and emerge around April where the queen then finds a suitable nesting site and begin to build a nest made from a kind of paper, composed of chewed wood fibres. Wasp colonies increase rapidly in size. Adult wasps feed on nectar or, in fact, anything sugary. They feed their larvae on insect prey and are rewarded with a drop of sugary liquid. In the garden, they may be seen visiting some flowers for nectar. They may also be seen catching and killing garden pests to feed to their offspring. In fact, they are really much more beneficial to us than most people would believe. One worker wasp can collect over 100 aphids per day. Wasps cause the greatest problems to us when the adults are searching for their own food. When colonies become large, the normal sources are not sufficient and adults turn to sources such as ripening fruit, jam and beehives, for honey. 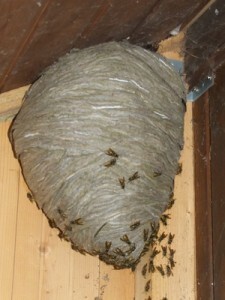 Wasps do not store food in their nests, nor do they swarm like honeybees. The nest, which grows as the colony grows, is the nursery of the colony. Unless a wasps’ nest has been threatened or disturbed, wasps will tolerate quite close observation by humans. However, any disturbance of the nest is likely to result in extensive and determined defence, which is so great that at times there seems little to distinguish it from aggression. Most of the bee species in the UK are not honey bees or bumblebees at all. The rest, are what we call ‘solitary bees’, and they get this name because their nests don’t have a queen with workers, unlike bumblebees and honeybees. 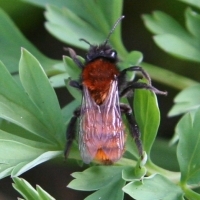 It can be very difficult to identify solitary bees, but some of the common species are spotted in gardens. 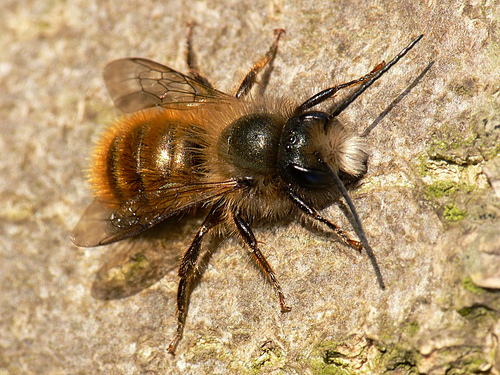 Many of the solitary bees look like honeybees. They often nest near to each other in ’villages’ and beekeepers receive many ‘swarm calls’ that turn out to be solitary bees in a lawn or wall. They are all valuable pollinators and only sting if handled roughly. Some common bees you might see are listed below. Mason bees live in small holes in wood or masonry. They look quite small and sleek, and are often blue or red in colour. They are good pollinators so some gardeners build nest of wooden tubes encourage them to set up home. Carpenter bees tunnel holes into wood, and can sometimes cause significant damage to property if allowed to build many nests close together. They vary in size, but in general they look a little like bumble bees but with a shiny hairless abdomen. Mining and Mortar bees dig holes in dry firm ground or old masonry to use as nests. They look a little like smaller and less colourful bumblebees. 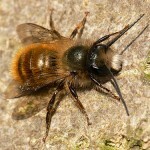 For more information about solitary bees go to the Bumblebee Conservation Trust Website.